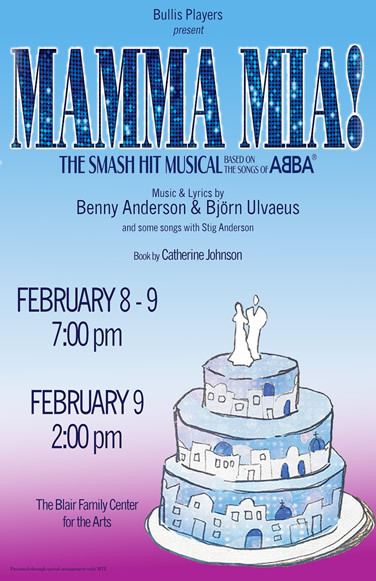 Bullis Players Present Mamma Mia! Get ready to say "I Do, I Do, I Do, I Do, I Do!" when Mamma Mia!, the smash hit musical based on the songs of Swedish super-group ABBA, bursts onto the Bullis stage! This vivacious musical comedy about mothers, daughters, old friends, and new family tells the story of Donna, an independent single mother, and Sophie, the spirited daughter she's raised alone on an idyllic Greek island. Sophie is about to get married. Donna invites her two best girlfriends to the wedding, while Sophie secretly invites guests of her own: three men from Donna's past ... in hopes that one of them will be the father she's never known. Over 24 chaotic hours, new love blooms and old romances are rekindled on this lush island filled with possibilities. Take a chance to dance, jive, and have the time of your life! Tickets ($10 each) may be purchased in person at the box office. The show is free for Bullis School students and staff. Margaret Gilbert stars as Donna, the former lead singer of a '70s girl group and free spirit who now runs a tourist villa on the island. Gilbert delivers a powerhouse performance displaying her stellar voice in lively numbers like "Money, Money Money," sentimental songs like "Slipping Through My Fingers" and especially in her dramatic rendition of "The Winner Takes It All." Maddie Mancuso is both winsome and strong-willed as Donna's daughter Sophie. Mancuso is a perfect fit for this plucky role, balancing both the girlish wonder and fervent excitement of a young bride-to-be. Her strong yet effortlessly sweet voice shines throughout the production, most notably in "Honey, Honey," and "I Have a Dream." Rachel Sita and Autumn Bryant are funny and lovable as Donna's best girlfriends from her one-time backing band, Donna and the Dynamos. Sita is both elegant and feisty as wealthy, multi-divorcee Tanya, who teaches a frisky boy toy an important life lesson in her clever and flirtatious version of "Does Your Mother Know?" Bryant is sharp and sassy as practical and no-nonsense feminist Rosie – her rendition of "Take a Chance on Me" is a hilarious throw-caution-to-the-wind take on the familiar tune. Together, Gilbert, Sita and Bryant do a great job of conveying the lifelong bond between these women, and their trio version of the famous ballad "Chiquitita" is a distinctly tender moment among an array of upbeat show-stopping numbers. Dylan Moore, Caleb Caceres, and Mark Williams are each charming in their own way as the trio of bemused, middle-aged potential dads. Moore's undeniable charisma make him a great fit for the role of Sam Carmichael, the New York City architect who has always held on to his torch for Donna. Caceres is gruff and goofy as the devoutly single writer and adventurer Bill Austin, and Willams is sweet and affable as wealthy British financier Harry Bright. The girl power theme that runs throughout the production is also embodied in another trio of friends. Supporting Mancuso through her journey of self-discovery are her best friends Ali and Lisa, played with earnest exuberance by Ava Caceres and Coco Guo, respectively. Adding sparkle and zeal to an already outstanding cast of characters is an exceptional ensemble made up of Lily Bass, Allie Berman, Emma Bookoff, Charlotte Caine, KiAnna Dorsey, Logan Dross, Sara Durbin, Julia Evans, Paggy Han, Tamia Haskins, Alana Hodge, Colleen Kazanjian, Agnes Kong, Ryanne Mills, DC Noce, Peri Perkins, Meghan Simpson, Gemma Sun, and Ashleigh Taylor. Mamma Mia! has an impressive pedigree and has been seen by over 54 million people around the world. The original West End production opened 20 years ago in London. The Broadway production closed on September 12, 2015 after 5,773 performances and the international tour has visited more than 74 cities in 35 countries. The feature film adaptation was a major blockbuster grossing over $600 million worldwide.